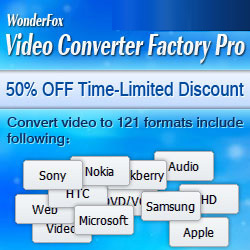 Aug 30, 2013 – WonderFox Soft announced the upgraded version of its most practical program – Video Watermark. Focusing on end user, the new version improved its functions and fixed minor bugs existed in last version to provide better experience and stable performance for our consumers. Icons and buttons on UI are newly designed and given nice tweaks. We believe that when people are using the new version of Video Watermark, it will lead to less causes of inconvenience to users. Additional option newly added (“Remove” button and right-click option on the video list section) is designed to suit your need anytime and anywhere, which means it will offer up the right things, in the right place, right when you need them. Thanks to hard work of developers of Video Watermark during last two months, here comes Video Watermark 2.5. With the improvement in functions and even details, undoubtedly Video Watermark 2.5 would be your top pick to watermark and edit your original videos in batch. So get started now to brand videos made your own. It is one of handy tools you deserve to have! Video Watermark Software focuses on protecting videos’ copyright. It allows you to insert text, image like your company’s logo and even shape watermark to videos. It is an excellent way to stamp a personalized identification mark on the visual material. Click to learn more about Video Watermark.